Nothing quenches summer’s heat better than Blue Lagoon Cocktail Popsicles! The color alone takes the edge off, doesn’t it? Mocktail version included. 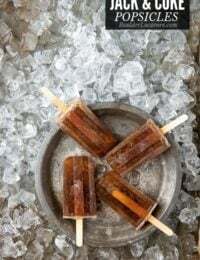 Perhaps it was writing about best family beach vacations on the east coast or emerging from three days straight of driving rain but I’m ready to start up this summer’s boozy popsicle recipes. 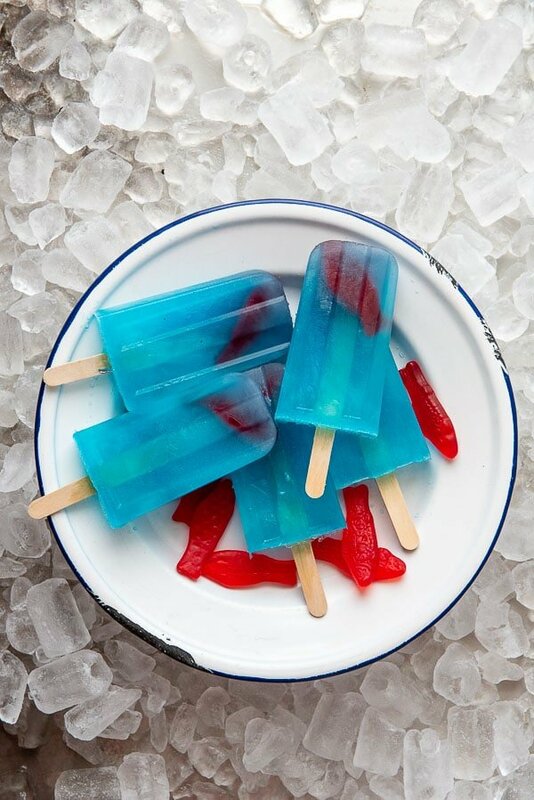 What a better way than with Blue Lagoon Cocktail popsicles (with a mocktail version too!). 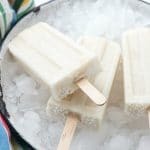 I started making cocktail popsicles a few summers ago and find them to be a refreshing way to eat your cocktail all summer long. 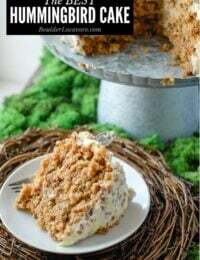 They are great for parties and holiday celebrations. I keep them stocked in my freezer all summer long. What Ingredients are in a Blue Lagoon Cocktail? A Blue Lagoon cocktail is a combination of blue curacao, vodka and lemonade. It’s light and refreshing in the most fabulous shade of bright blue! Blue Curacao (pronounced ‘cure-a-sow’) is a liqueur made from the dried peels of lahara, a native orange to the island of Curacao off the eastern coast of South America. What Does Blue Curacao Taste Like? Would you be surprised to learn the flavor of blue curacao is orange? It famously colors iconic cocktails like the Blue Hawaiian but would be used where Triple Sec or Grand Marnier would be in a cocktail. It has a light orange flavor. The color of these Blue Lagoon Cocktail popsicles is simply irresistible, refreshing and perfect for summer! Like the cocktail, it combines blue curacao and lemonade. However instead of vodka I’ve added more ‘blue’ in Hawaiian Punch. 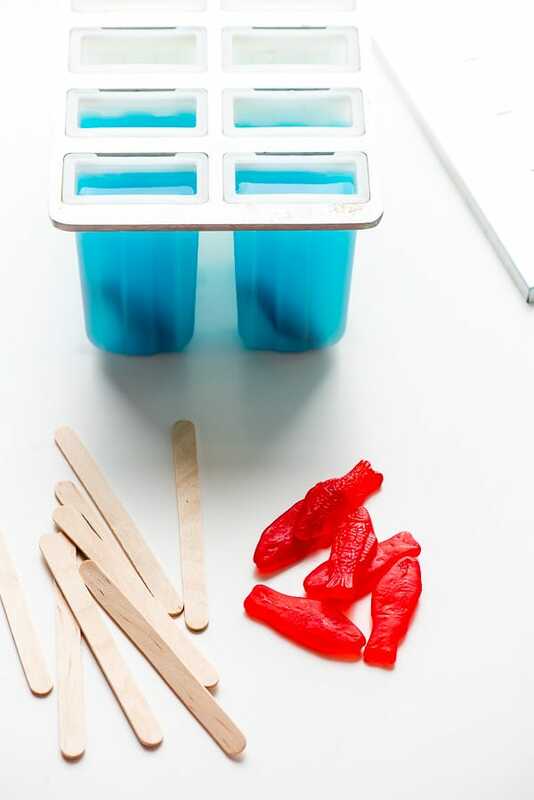 A red Swedish Fish has been added to the cocktail popsicles for a fun surprise too. With boozy popsicles, more isn’t better when it comes to the liquor. 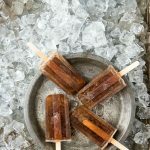 Because alcohol does not freeze in the same way other water-based liquids do, to ensure solid freezing of boozy popsicles the percentage of liquor is smaller. If you decide you want to bump up the percentage of liquor to be higher, you’ll find a slushy result when releasing the popsicles from their mold. This recipe is an easy one to make into a fun mocktail (Shark Week, anyone?!). Remove the blue curacao from the recipe and ½ ounce more lemonade or Hawaiian Punch instead. Using a 2.5 ounce/cavity popsicle mold, 0.5 ounce of blue curacao is poured into each mold. NOTE: to maintain equal volume of liquor for best freezing, pouring the blue curacao into the molds versus mixing it with the other liquids is recommended. 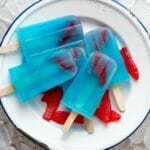 Combine the lemonade and blue Hawaiian punch, and pour 2 ounces into each popsicle mold. Add a Swedish fish if desired. 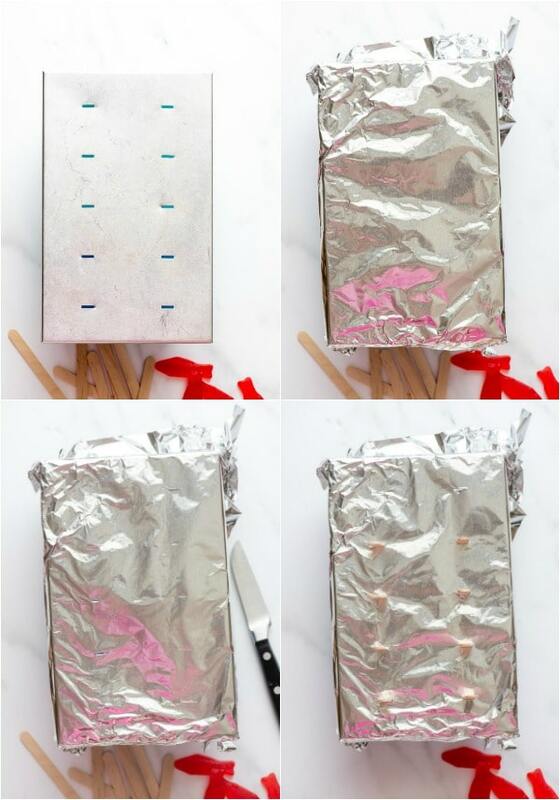 PRO TIP: Place a sheet of heavy foil over the top of the mold. Run a finger over the area of the mold where the popsicle stick slots are to identify their location. Use a knife to pierce through the hole and then insert the popsicle sticks. This helps keep the sticks upright and in place while freezing. To Release Popsciles from mold: run exterior of the molds (not the top but the plastic cavities) under hot water for a few seconds to relase the popsicles. 10 cavity 2.5 ounce/popsicle Popsicle Mold (this is the one I used here). 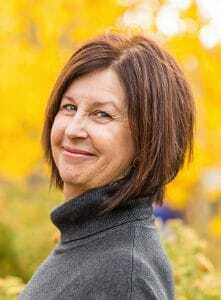 This onelooks interesting too. If you’ve tried this Blue Lagoon Cocktail Popsiscle recipe or any other recipe on BoulderLocavore.com please don’t forget to RATE THE RECIPE and let me know where you found it in the comments below, I love hearing from you! 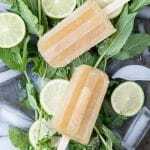 The refreshing citrus punch boozy popsicles will be a summer favorite for the color AND the flavor. 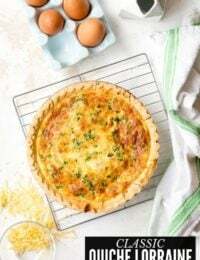 They are light and easy to make! Mocktail option included in the instructions. Total Time reflects an estimated 4 hours for freezing. May vary based on different freezers. Combine the lemonade and Hawaiian Punch together; stir to combine. 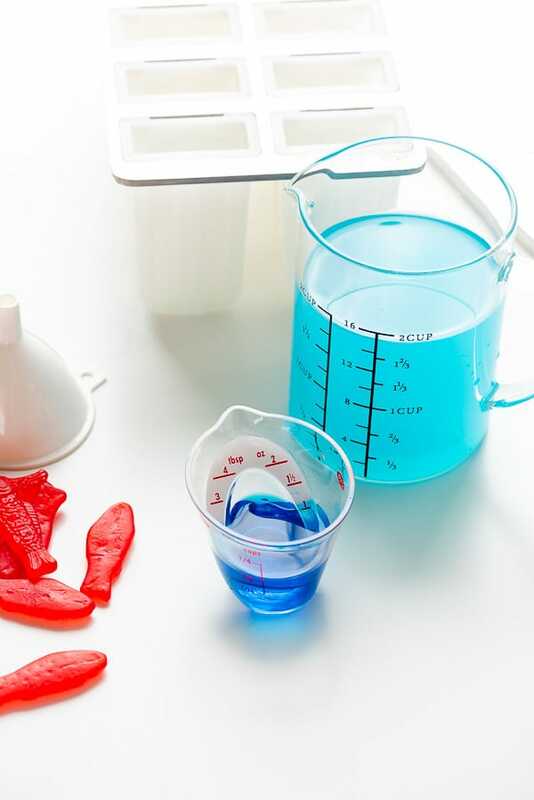 TIP: adding them in a 4-cup liquid measuring cup helps easily pour into mold (alternatively smaller quantities can be poured from a smaller volume liquid measuring cup). 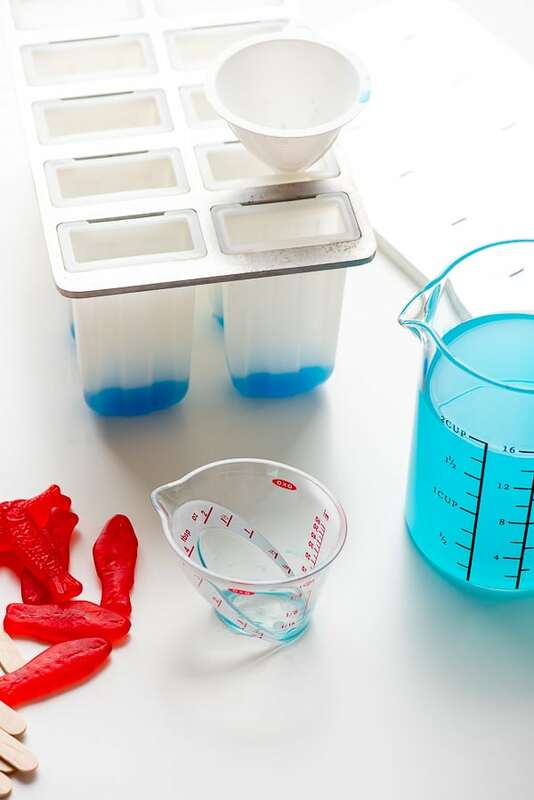 Pour 1/2 ounce of Blue Curacao into each popsicle mold. Pour 2 ounces of the lemonade/Hawaiian Punch mixture into the mold; stir with an extra popsicle stick. Add 1 Swedish Fish to each mold if desired. Omit the Blue Curacao and use 2.5 ounces of lemonade/Hawaiian Punch. Follow the rest of the instructions above. I love that I don’t have to share these with the kiddos! This would be a really fun treat for summer! It sounds amazing! Such a great option for warm weather! 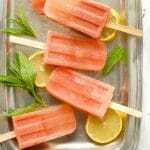 How fun are these popsicles! My kids would love this for summertime! I am definitely taking notes on these! Yum! 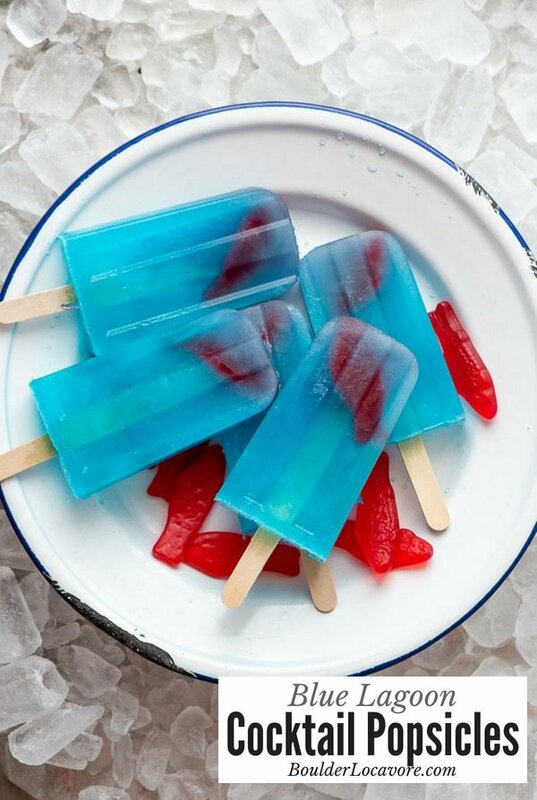 I love the nice blue color of this cocktail popsicles. It is visually appealing and looks refreshingly delicious too! 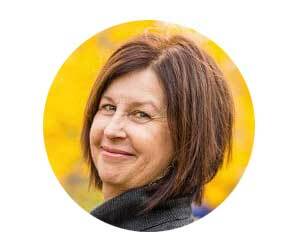 Thank you for sharing the recipe and letting us know a little something about curacao liqueur. Those are so cute! 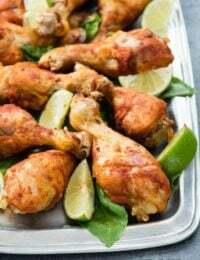 Perfect for summer barbecues when the grown-ups want to get in on the fun, too. I love the Swedish fish you added as it gives it a playful look. Oh my, YES!! After running around with the kids all day during the summer, this is exactly the treat this mama wants! I’ve not heard of Blue Curacao before. This looks and sounds like a yummy treat though! Thanks for sharing. These look really good! 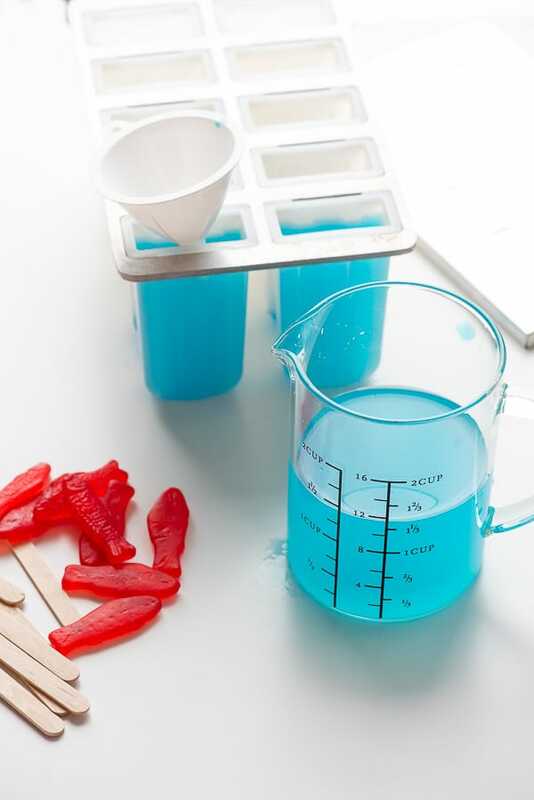 I have made the giant Jello shot fish tank with these fish and it was so good!! How fun is that?? And thanks for the mocktail version! These are SO MUCH FUN!! 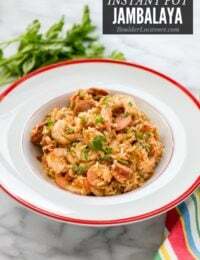 Love that you can make them for grown ups and kiddos. What an awesome idea! 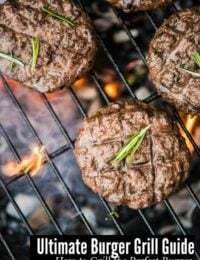 I’m totally serving these at my next backyard barbecue. We are having a big party here in 2 weeks and my friends are going to love these. Can’t wait to make them!